United States Senator, 1903-30, a leading supporter of Wilson's war policies, Speaker of House of Representatives. His home is here. Lee Slater Overman, United States senator, was born on January 3, 1854 in Salisbury, the son of William H. and Mary E. Slater Overman. He attended private schools until enrolling at Trinity College where he graduated in 1874. After graduation, Overman taught school for two years before being appointed private secretary to Governor Zebulon B. Vance from 1877 to 1878 and Governor Thomas J. Jarvis in 1879. While working with Vance, Overman decided to pursue the practice of law, and was admitted to the bar in 1878. In 1880 he began practicing law in Salisbury, and shortly thereafter threw his hat into the political arena. Overman became a state representative in 1883, a position he held again in 1885, 1887, 1893, and 1899. In 1894 he was appointed the president of the North Carolina Railroad Company. He also served as the president of the Salisbury Saving Banks and as a member of the University of North Carolina board of trustees for nearly ten years. A staunch Democrat, Overman presided over the Democratic Party state convention in 1900 and 1911. In 1903 he was elected a United States senator for his district having beaten out future governor Locke Craig. He was reelected in 1909, 1914, and again in 1920. During his service, Overman is best known for his strong support of President Woodrow Wilson’s war policies leading to the entry of the United States into World War I. 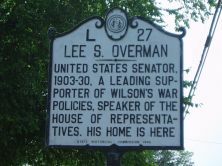 The Overman Act of 1918 gave wide leeway in war powers to the President by allowing him to coordinate government offices and the War Industries Board, giving Wilson comprehensive economic power. Overman was also head of a committee that was the precursor to the House Un-American Activities Commission. 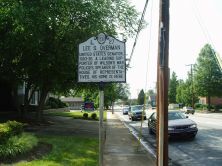 Overman died in office on December 12, 1930. He is buried at Chesnut Hill Cemetery in Salisbury. During World War II, a Liberty Ship, the SS Lee S. Overman was named in his honor.